With this model we demonstrate the combination of the DeCodingSpaces synthesis and analysis components in order to link them with a basic urban dynamics simulation. The definition creates a synthetic settlement and simulates the distribution of population and workplaces over time. The results from this simulation control the development of the individual blocks including the generation of pacelling patterns and the placing of buildings of various typologies. The model was first introduced at the seminar “Applied System Dynamics for Urban Modeling and Simulation” of the Professorship for Computational Architecture at the Bauhaus-University Weimar, 2018. It is based on the models described in the article Urban Simulation with Grasshopper for Rhino3D. The Grasshopper files are created for Grasshopper (build 0.9.0076) with Rhino3D v.5. To open and run the models you need to instal the Anemone plugin (we used version 0.4), and the DeCodingSpaces-Toolbox (you need the version from 24.04.2018 or later). The animation shows how the simulation results are used as basis for the development of individual blocks. 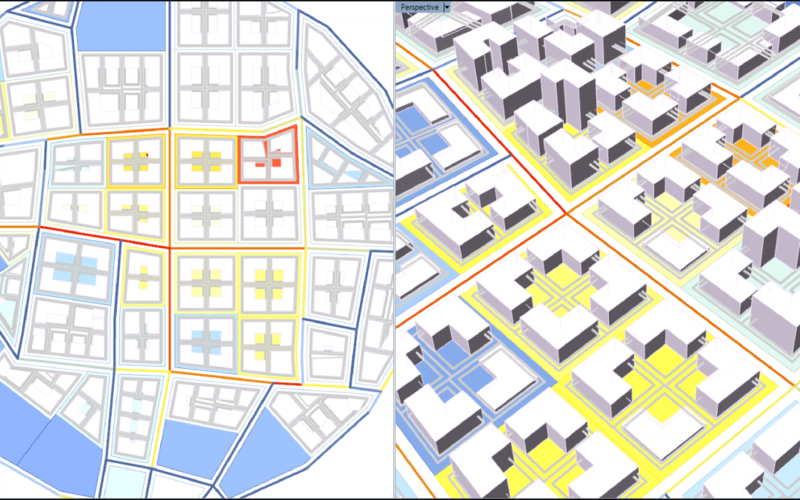 The video demonstrates step by step the combination of the DeCodingSpaces synthesis and analysis components with the urban development simulation. Can I set a boundary within a larger boundary and lay out the street network in between them. Let’s say the smaller boundary is an old organic district, and I would like to simulate an urban expansion by continuing from the district’s street network. How can I do this on grasshopper ? We work on a feature to add unbuildable areas. For now, a solution would be to draw a polygon that defines your buildable area. For example, a U-Shape should demonstrate the principle. You can connect to the existing network with the “initial segments” input parameter.